When our 1988 Mercury Sable sedan began to suffer "strange problems" (It would refuse to start until it "rested" for an hour or two) which a couple of professional mechanics failed to resolve, we decided to find a new (to us) car. 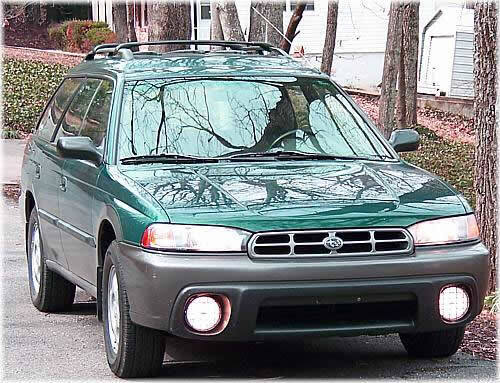 An ad in the local paper led us to this Subaru. We test drove it and the owner agreed to let us have it inspected by our mechanic, who found several maintenance issues like leaking valve-cover gaskets, but no serious problems. There were four new tires mounted when we bought the car; a brand I didn't recognize - Goodride - which sounded suspiciously Chinese to me. Sure enough, they come from the PRC through a Canadian distributor, and this make recently had a recall of their light-truck tires in Canada. However, these passenger car tires were not implicated in the recall, and no problem with them is known. << That brings our investment to $3,800; more than we wanted to spend, but still a good value for a vehicle whose high retail blue book is about $5,200. One odd fact; the FWD light was on in the instrument cluster. No one seemed to know what this meant, and a reading of the Owner's Manual (which was included with the car) didn't offer much help. According to that, FWD (front wheel drive) could be selected for "service purposes" but no details are given. The purported reference in the manual doesn't exist. 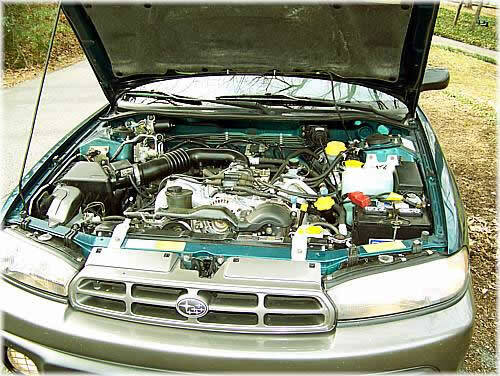 Internet research in several discussion forums led to a receptacle under the hood labeled FWD containing a fuse, which when removed, put the car back into AWD (All Wheel Drive) as it is designed to operate all of the time. The difference between all wheel and four wheel drive is subtle but real! All wheel drive is a system in which all four wheels are driven all of the time, with torque being divided between the driving wheels proportionally and in response to driving conditions, whereas four wheel drive permits the driver to select either 2- or 4-wheel drive, and when in 4-wheel drive, the driver must exercise caution because driving on pavement with normal traction can easily result in "locking up" the drive system. Subaru boasts (not surprisingly) that their symmetrical all wheel drive system is notably better than any other being offered by auto makers including Mercedes, Audi, Saab, and so on. So maybe we will look for some snow to drive in. Ha! Don't hold your breath! 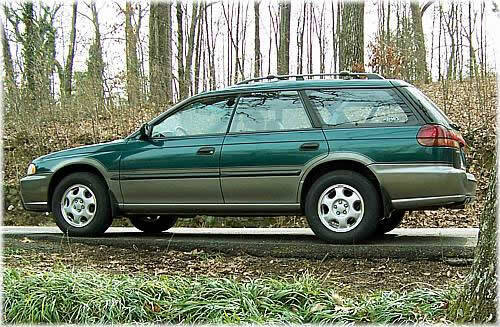 More to the point, the ride and handling of this Outback leave nothing to be desired; it goes precisely where pointed with no steering slack, handles potholes and irregular pavement quietly and competently. The drive train is silent and the engine can barely be heard below 4000 rpm. 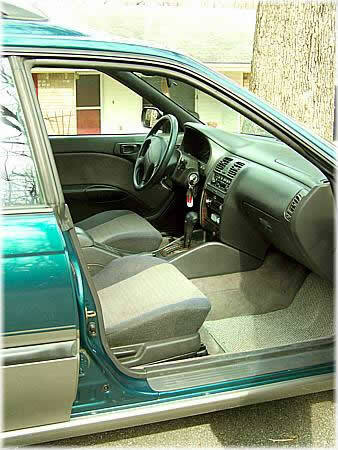 << The inside of the car appears gently treated. Records show one previous owner, a woman who bought the car in New York state but now lives here in Chattanooga. It was traded to the big local Subaru dealership. The person from whom we bought it only owned it for about 2 months. Turns out he is a part-time used car dealer who thought the car would serve his family (who otherwise uses a huge Ford Explorer wagon) to give better mileage, but they didn't fit into the Subaru (uh huh -- they are really BIG.) He had not titled the car, so we are the second owners. 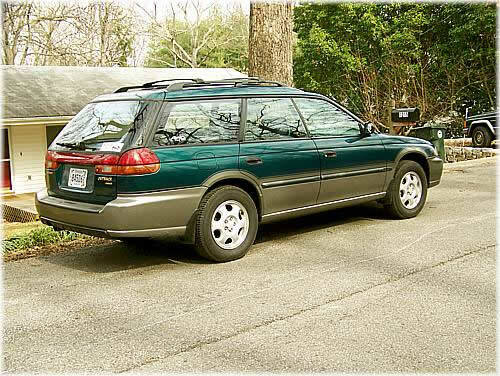 Depending on your computer monitor the car might appear to be either blue or green. Annabelle and I agree that it is green, but it definitely has a blue tinge, and when photographed in overcast daylight, the photos were quite blue. Seen here, they have been color corrected to what appear to my eye as pretty close to correct. "Northern" features include heated seats and outside mirrors. The seat heat works, but I haven't had a chance to defrost the mirrors (yet.) There is an (never used) engine block heater cord coiled up inside the front bumper. That's another feature I hope to never use! I'm sure the engine compartment was steam cleaned by Kelly Subaru after they took it in trade, but the rest of the chassis is also clean with no signs of salt corrosion. While the inside floors show some wear (largely only the driver's side) there are new "Subaru" mats in place, and the rear floor and upholstery are in excellent condition. Door trim and controls are nearly as new. Apparently the hood has been repainted. Some very small overspray was seen on the front fenders (I removed it with one application of polishing compound) and a very small "ripple" can be seen in the hood if you get the light just right. I'd guess a fender-bender crimped the hood, but there's no sign of bumper or trim damage or replacement. 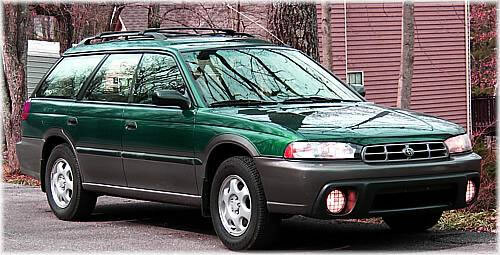 Only a few days after our purchase, the Outback began to "act up." The engine would stop running with no warning - if we were making a left turn through traffic at the moment, this was more than merely irritating. Over several days the problem increased - the engine would always restart with no problem, but still this was definitely unacceptable. Back to the garage; they could not get the problem to show up and there were no "codes" stored in the computer - indicating that the problem was not something that was detected or "commanded" by a control system. I discussed this with my favorite mechanic; we both suspected a loose connection somewhere in the ignition system. The mechanic removed, cleaned and reinstalled sensors and connectors, using dielectric grease to protect connections where required. A drive of 20 miles, including some high speeds, demonstrated that the problem was gone. A trip of about 40 miles across town and back in the rain presented no problem at all -- hooray! Then the next day, on a six block trip (to pick up a grandchild from school,) the same stop-restart happened very quickly three times! And of course, this is a Friday afternoon, so nothing can be done until next Monday. If I say "Damn it!" really loudly, would you be offended? Drove fine across town and on a short Interstate run; then after a harder-than-usual stop at a light, the engine just quit. As usual, it restarted instantly with a twist of the key, idled and ran just fine - then a few miles later at 55 mph it died again four or five times, ran OK for another mile or so, then stalled when starting from another traffic signal. When restarted, ran OK again. But this is intolerable; wife refuses to drive until it is fixed -- what would happen, for example, if we were making a left turn through several lanes of oncoming traffic and it decided to quit? Not good. Once more to the shop - a suggestion; leave the car with them and let them drive it for a day or two . . then on reconsideration, we rejected that because there was nothing they could do to analyze the problem if it stops in traffic! What are they going to do; get out, open the hood and start running an analysis? So they removed, cleaned and replaced all of the electrical grounds - none of them showed any sign of corrosion, but they are a common cause of electrical "mysteries" like this. Did some more research, and decided, regretfully, that component replacement was the only reasonable option. Sensors that can shut off the engine will be replaced one or two at a time to see if the problem is cured. This means $$$ but nothing else appears feasible. Suggestions are welcomed. With gasoline hovering at $4/gallon, we will be holding the speed down to 55 or so; that still works out to about 13 cents/mile for fuel on this roughly 3000 mile round trip, or abut $390 for gasoline alone if we get our usual 30 miles/gallon.